I worked on two community mural projects as an artist, fundraiser and organizer. 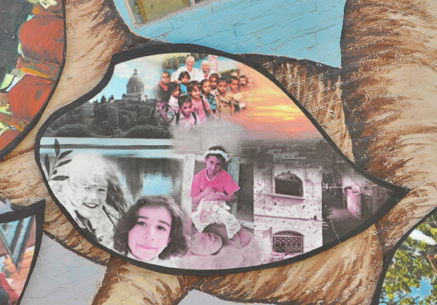 The first is the Olympia Rafah Solidarity Mural Project. While working for the Rachel Corrie Foundation for Peace and Justice, the mural’s sponsor, I designed a leaf (below), raised funds, organized logistical support, recruited new project members and served as a core team member in the first phase of the project. The mural is on permanent display in downtown Olympia, Washington. While working for the Squaxin Island Tribe, I collaborated with art lead Taylor Wiley Krise and his assistants John Ackerman and Casey Brown to organize a mural project that included participation from teens in the tribe. The final mural celebrates a life in balance with the seasons and cultural teachings and is permanently installed on the Squaxin Island Tribal Gym building in Kamilche, Washington.